You would think that a serious disease has a very high potential of ruining your life in all its aspects, crushing dreams, ending your social life and making you always wonder one of the most haunting questions “why me?”. But Hazel Grace Lancaster and Augustus Waters are here to prove us wrong. These two will make you smile, then make you cry, then smile again and all the way will teach you lessons like: even if you’re in a tough fight with a disease like cancer, there is always time for dreams, love and making the most out of the time you’re left with. Hazel is on treatment for thyroid cancer with mets in her lungs which reduced her lungs’ capacity to function, thus forcing her to wear a cannula 24/7 so that she won’t have serious problems breathing. Augustus is in remission from osteosarcoma (bone cancer) but still attends support group to accompany his good friends Isaac who also has cancer. There is where Augustus and Hazel meet for the first time and also when they become each other’s support. 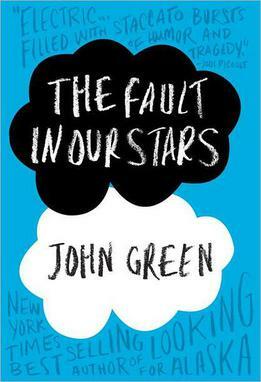 “The fault in our stars” is John Green’s 4th novel and was published January 2012. Even though I regularly watch a few youtubers, I did not come over John & Hank’s channel “the vlog brothers”. Rest assured, when I found out, I subscribed immediately. There you can find some “inside” information about the book and the movie that will come out June 6 th in the US and hopefully around that time also in Romania. Being a bit of a nerd myself, I liked that the characters bonded over literature and talks about oblivion, death and how “the world is not a wish granting factory”. There were numerous times when Hazel and Augustus debated over a specific book that she described as being: “as close a thing I had to a Bible”. Also I have to say that I really appreciated this book. There is something about this kind of stories and I don’t mean just the love part, but mostly the part about pain & suffering. Most of us (I want to refrain from generalization and not say everyone because I guess there are people in this world who evolved to such a state that they don’t fear anything anymore) have our specific fears about things we don’t want to happen to us in life or that we already experienced and maybe want to forget. Reading about other people’s fears, even fictional, has the potential to touch us in a way that few things can. Whether we identify ourselves with the characters or they just remind us about our own concerns, it tends to strike a cord. Also makes us think about those fears and concerns and about “what if” we tried to confront them altogether. We don’t have to do it alone if we don’t want to. Besides teaching us a lesson, this book also gives hope and shows you how even from the saddest situation brighter moments can arise. I also liked that it actually gives a little more credit to teens, shows that they can also be smart and grounded and can take pleasure in intellectual activities not only in parties and twerking. I really recommend you read this book because even if it sounds like teen literature or young-adult type of book, there is something older adults can enjoy and appreciate because it’s an honest and touching story about love, pain and how it is possible to live “a forever within the numbered days”. Because let’s be honest: we all have our days numbered. Cancer patients just happen to approximately know their number, while we, others, don’t. I loved the book and I've also seen the movie. Good writing, Olga!